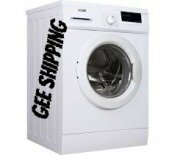 PRODUCT (140) Ship (1) washing machine to Dominica, St.Lucia. Antigua, St Kitts, Barbados, Trinidad, Grenada, St Vincent, Guyana. FREE PICK UP ONLY IN THE LONDON AREA. Ship (1) washing machine to Dominica, St.Lucia. Antigua, St Kitts, Barbados, Trinidad, Grenada, St Vincent, Guyana FREE PICK UP ONLY IN THE LONDON AREA.